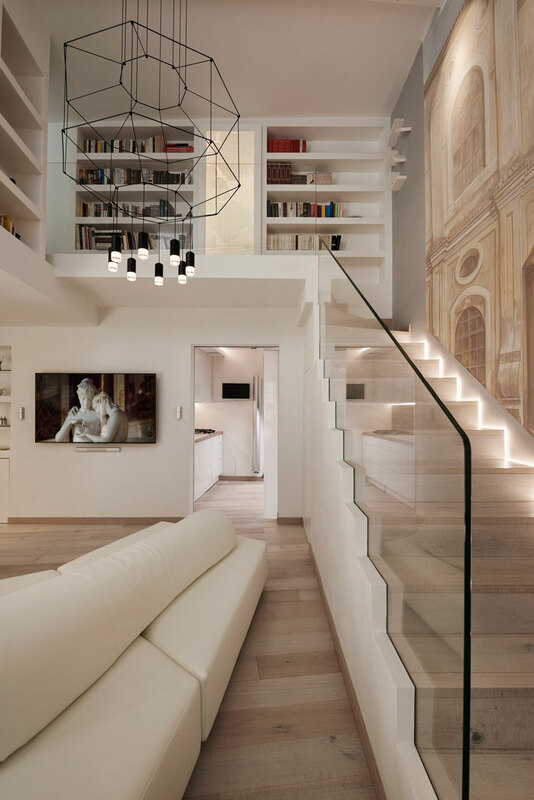 Located near Piazza Navona overlooking the rooftops of Rome, a penthouse in a centuries-old building received a stunning renovation courtesy of Carola Vannini Architecture. Honoring the home’s historic roots while updating its interior, the designers created a compelling contrast of old and new. 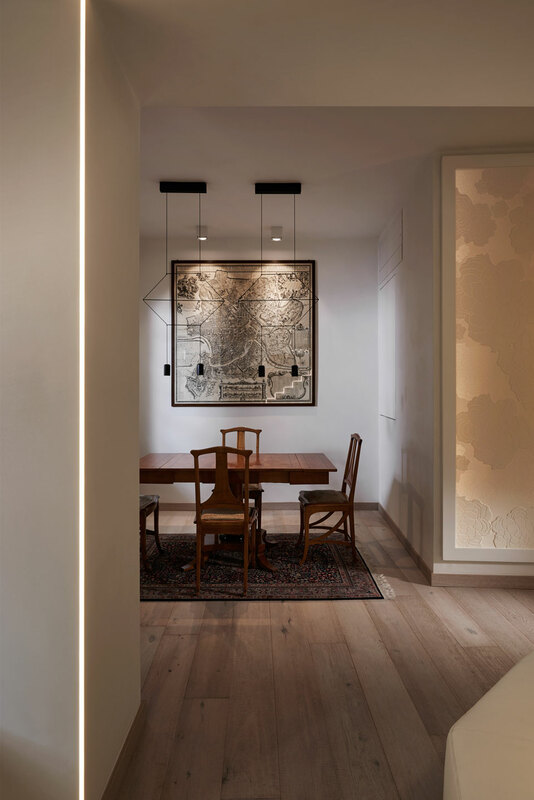 The ancient architectural envelope now plays host to a minimalist composition of contemporary furnishings and lighting —including several Vibia fixtures— arrayed against a backdrop of crisp white walls. 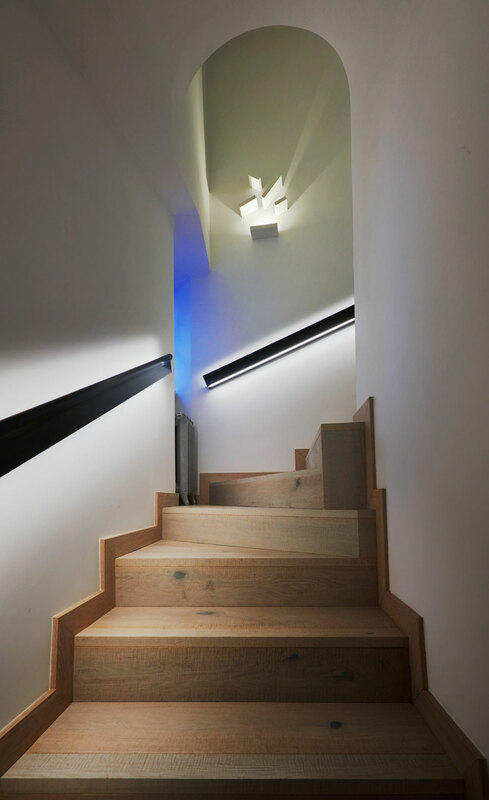 On the wall ascending the stairs to the residence’s entrance hangs a striking installation of the Set lamp by Xuclà. A customised composition of rectangular pieces that both generates and reflects light, it casts elegant rays of light and shadow against the blank canvas of wall like a piece of dramatic décor. A modern sculptural counterpoint to the rounded archway below it, its angular form echoes the slanted railing of the staircase. 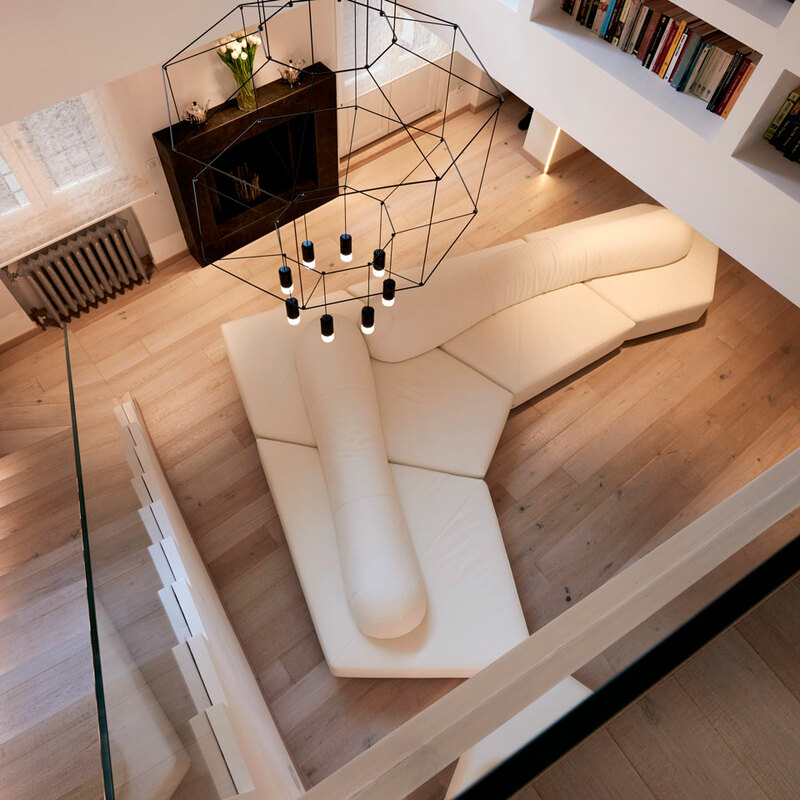 Suspended in the lofty double-height living area, Arik Levy’s Wireflow draws the eye upwards. Formed of slim black cables that provide a graphic punch within the room’s pale palette, Wireflow is a cutting-edge take on the classic chandelier. 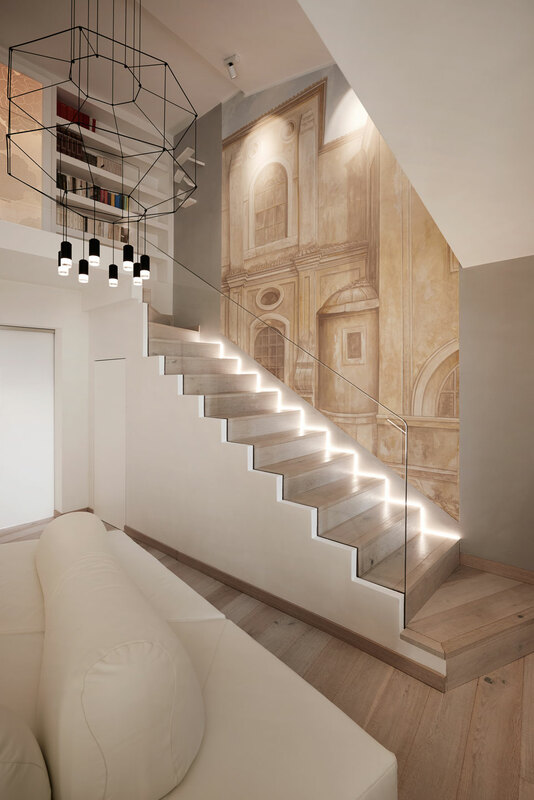 Its airy, three-dimensional silhouette offers an unobstructed view of the illuminated staircase and original tromp l’oeil fresco that borders it. Levy’s futuristic Wireflow Lineal provides a pleasing juxtaposition with the traditional wooden table and chairs in the dining room. Suspended in tandem like a transparent curtain tipped with LED terminals, its web of fine cables adds a geometric feel to the space while picking up the dark tones of the wall map behind it. Brightening the master bedroom upstairs is the Pin sconce designed by Ichiro Iwasaki. Complementing the room’s quiet colours and streamlined sensibility, its slender lines stretch outwards from a bold circular base. 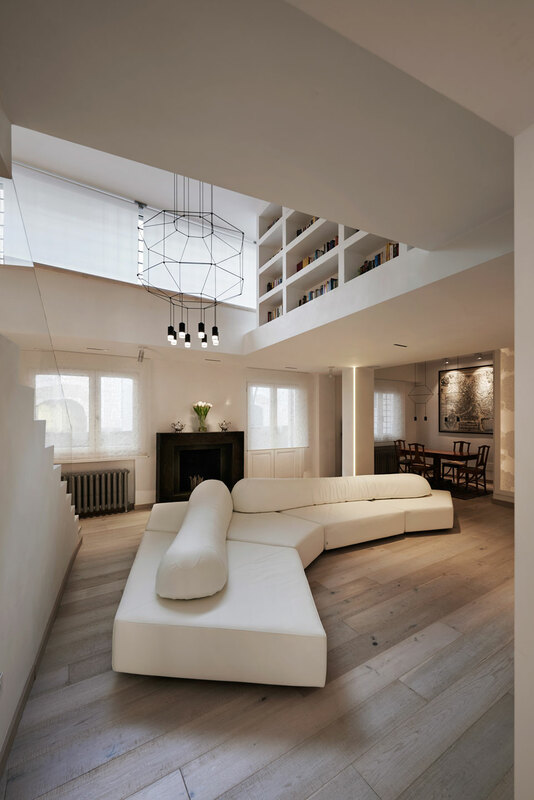 Its tips radiate in a gleaming nimbus of ambient light, subtly doubling as abstract art amid the minimalist décor.